Whether paddling, sailing or enjoying another kind of watercraft activity, being out on the water is fun for Scouting youth of all ages. One of the most important pieces of safety equipment for water-based adventures is your Personal Floatation Device (PFD) or lifejacket. 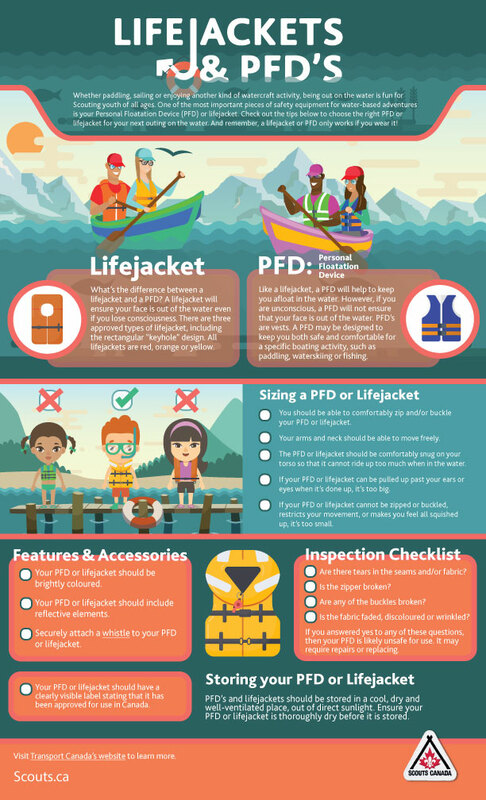 Check out the tips below to choose the right PFD or lifejacket for your next outing on the water. And remember, a lifejacket or PFD only works if you wear it! What’s the difference between a lifejacket and a PFD? A lifejacket will ensure your face is out of the water even if you lose consciousness. 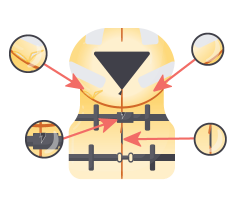 There are three approved types of lifejacket, including the rectangular keyhole design. All lifejackets are red, orange or yellow. Like a lifejacket, a PFD will help to keep you afloat in the water. However, if you are unconscious, a PFD will not ensure that your face is out of the water. PFD’s are vests. A PFD may be designed to keep you both safe and comfortable for a specific boating activity, such as paddling, waterskiing or fishing. You should be able to comfortably zip and/or buckle your PFD or lifejacket. Your arms and neck should be able to move freely. The PFD or lifejacket should be comfortably snug on your torso so that it cannot ride up too much when in the water. If your PFD or lifejacket can be pulled up past your ears or eyes when it’s done up, it’s too big. If your PFD or lifejacket cannot be zipped or buckled, restricts your movement, or makes you feel all squished up, it’s too small. Your PFD or lifejacket should be brightly coloured. Your PFD or lifejacket should include reflective elements. Securely attach a whistle to your PFD or lifejacket. Are there tears in the seams? Are any of the buckles broken? Is the fabric faded, discoloured or wrinkled? If you answered yes to any of these questions, then your PFD is likely unsafe for use. It may require repairs or replacing. 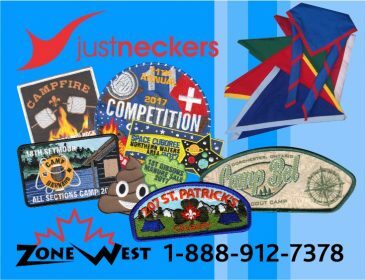 Your PFD or lifejacket should have a clearly visible label stating that it has been approved for use in Canada. PFD’s and lifejackets should be stored in a cool, dry and well-ventilated place, out of direct sunlight. Ensure your PFD or lifejacket is thoroughly dry before it is stored. Visit Transport Canada’s website to learn more. You can view more Safety Tips at Scouts.ca/safety.